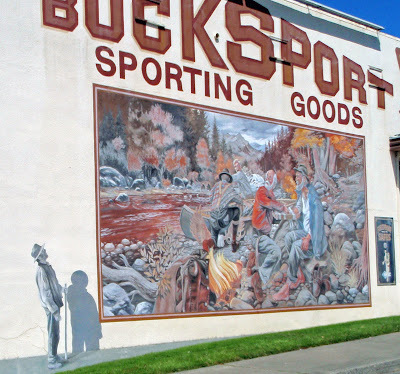 A recent road trip from Southern California to Portland, Oregon sparked thoughts about murals. Growing up in a suburb of Denver I remember driving through North Denver and seeing eye-catching and thought provoking murals. These images remained dormant until my last semester in college when I was completing an internship with an English/Spanish/Jazz/KPFKesque radio station. As my final project I decided to do a piece on the murals of North Denver...yes, I NOW see that murals are visual and I was at a radio station and perhaps I should have concentrated on something more auditory, but I didn't. I'm glad I didn't because my search lead me to Emanuel Martinez, a Denver born and raised Chicano artist. He was the creator of the murals that stayed implanted in my brain. I had the opportunity to interview him at his studio way back in 1987. He now has a website, http://www.emanuelmartinez.com, where I found a picture of one of the murals from my childhood called La Alma painted in 1978. He briefly studied with David Alfaro Siquieros, one of Mexico's three influential muralists (Jose Clemente Orozco and Diego Rivera are the others). I've always admired them because they brought art right to the people with their murals and let them (the people) see themselves in the present and past and made them feel proud of their heritage. O.k., now back to the road trip where I saw many a fun and quirky mural. Here are just a few that added a little extra eye candy to my already picturesque trip. The first one I was able to take a picture of was in Eureka, California. We stopped to eat lunch at a neat little restaurant called The Golden Harvest Cafe and there it was right across the street on the Bucksport Sporting Goods Building. The mural was created in 1996 by Duane Flatmo, http://www.duaneflatmo.com/. I love the movement and the colors (if you go to his website you can see a better and more colorful picture), but that black and white figure off to the side adds so much more interest for me. I love when there's a bit of mystery! The next mural was found at an old elementary school converted into a Portland-layed-back-cool-community-fun-place called McMenamins Kennedy School. (There's lots more info. on their website, http://www.mcmenamins.com/) My niece took us there for dinner and as we waited for a table we checked out the artwork that somehow relates to an event, memory, or teacher from the 82 year old history of Kennedy School. 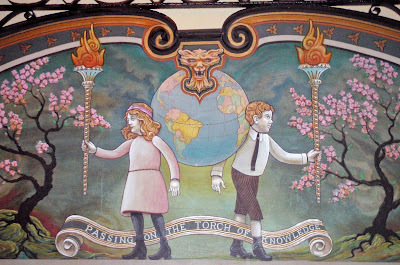 This mural entitled "Passing On the Torch of Knowledge" at first glance was a little eerie. The children look like those Renaissance paintings where babies have adult faces and they don't look too excited about the "knowledge" they are passing. As I read more about it, I like how the artist, Lyle Hehn, put as many symbols as possible without making it look like a Highlight's "Hidden Picture" page. The cherry trees, for example, were donated to the school in 1939 by a Japanese family and those "adult" kid faces are actually somewhere on the building itself. I ended up liking the mural and appreciated the artist's ability to incorporate different elements into one cohesive composition. My husband pointed out this mural as we were walking to the Farmer's Market held at Portland State University. It adorns the Sovereign Hotel (1923) which is now the Oregon Historical Society. Richard Haas, http://www.richardhaas.com/, was commissioned to design this mural in 1989 (along with another one that I didn't see, but it can be viewed on his website). This is a shining example of trompe l' oeil or French for "fooling the eye." 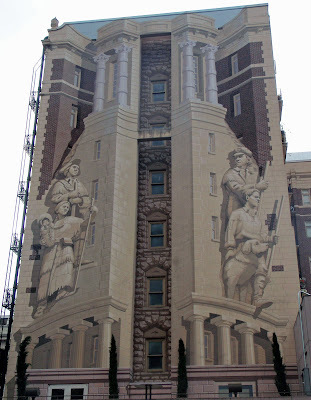 Yes, the imposing figures of Lewis, Clark, Sacagawea, her son Baptiste, a slave named York, and a Newfoundland dog are impressive, however, the painted architecture was dumbfounding! As I look at my photo now there are some areas where I can't tell what is real and what is paint.